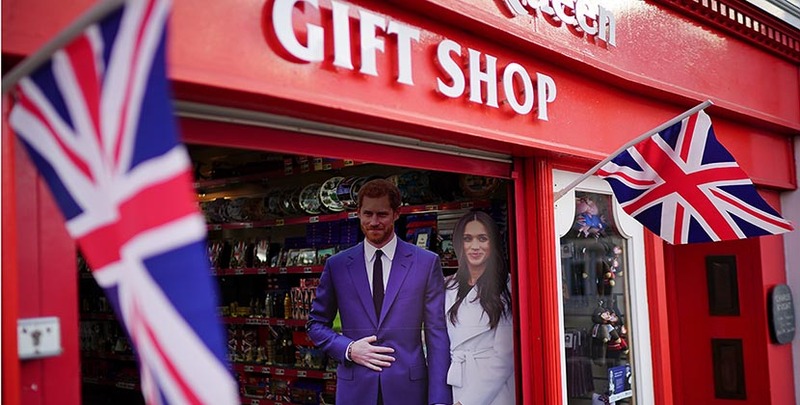 Souvenirs for royal weddings are as much of a tradition in the United Kingdom as tea and biscuits or double decker red buses. It’s not just that the English are fond of knickknacks. There is a history to them. Royal weddings were once very private affairs. Things changed with the 1840 marriage of Queen Victoria and Prince Albert. It was celebrated with a carriage ride in the streets, as well as the creation of souvenirs. There were medals, wedding lace and prints of the couple for children to color and cover in tinsel. The thinking from the Queen’s advisors was that the mementos were a way to make a connection between the royal family and the people. For Harry and Meghan’s royal wedding there are souvenirs galore. Among the official items being sold in the Royal Collection shop are tea towels and commemorative cups and plates. Creative options include Harry and Meghan: A Love Story Coloring Book. The best-seller on Amazon is reminiscent of the prints made for Victoria and Albert. For jewelry lovers there are several ideas. These may not feature pictures of Harry and Meghan, but they definitely carry the spirit of the happy couple and the royal family. 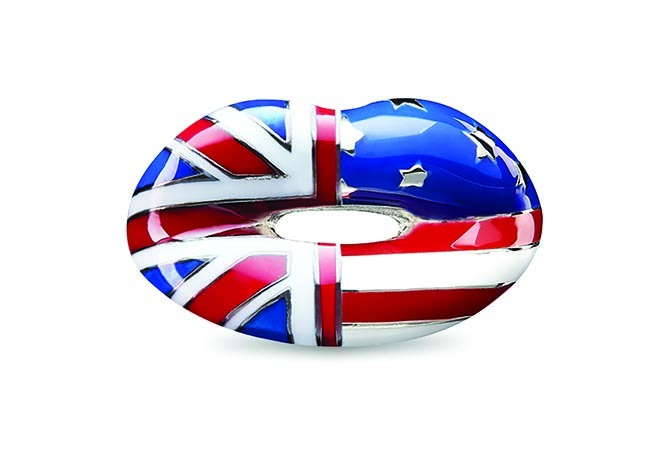 Solange Azagury-Partridge designed a new Hotlips “Special Relationship” ring symbolizing the union. It features the Union Jack and the Stars and Stripes flags spliced together in a lacquer and sterling silver design. 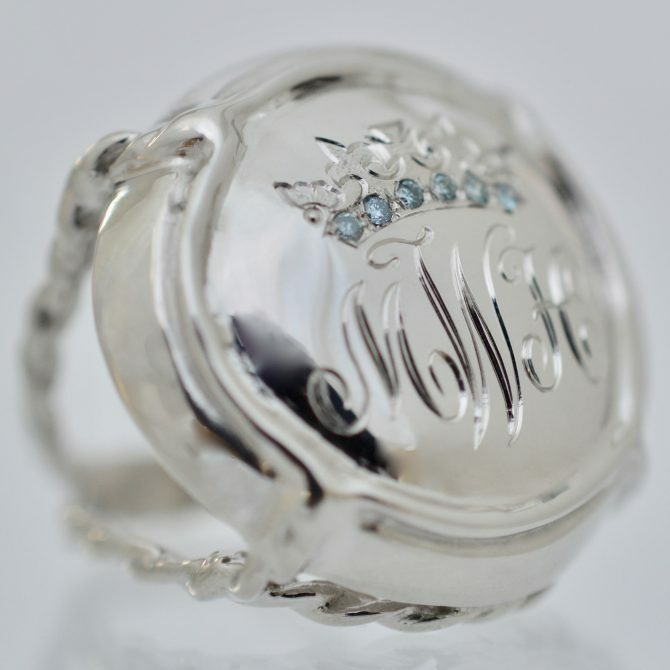 The ring is available to order for $280 on the designer’s new website devoted to Hotlips jewels exclusively. New York based jewelry designer Laura Lobdell created a deluxe rendition of her signature Champers ring inspired by the cap on a bottle of champagne as a souvenir. The statement jewel is hand engraved in platinum with the couple’s monogram centered beneath a crown cypher set with blue diamonds. The price is available upon request. 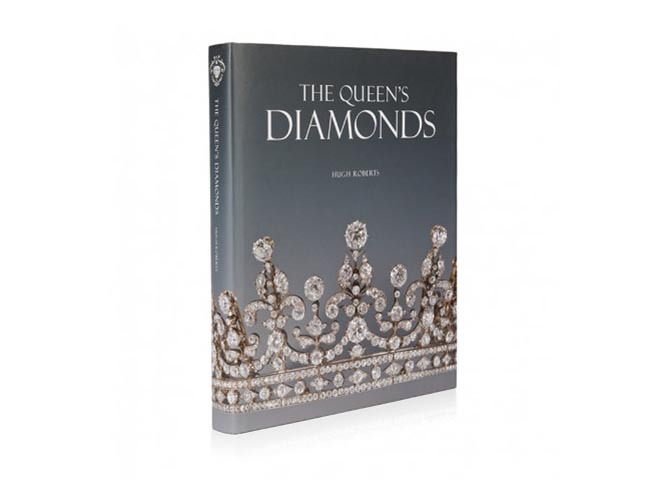 The Queen’s Diamonds, published to mark Her Majesty’s Diamond Jubilee in 2012, is the first authorized and definitive account of the diamond jewelry in the monarch’s collection. It was written by Sir Hugh Roberts, the former Director of the Royal Collection and Surveyor Emeritus of The Queen’s Works of Art. The extraordinary book covers details of all the pieces worn by the Queen, as well as Kate Middleton, to this day and the history behind them. Meghan Markle is a jewelry fan. Acquiring a piece like one she wears is another way to celebrate the wedding. A few weeks ago, she began to sparkle in Galanterie de Cartier studs. Since they are in white gold, as opposed to all the yellow or rose gold in her collection, we predicted they would be among her wedding day jewels. And they were! The earrings are available on the Cartier website where the price is listed as upon request. That is polite code for an expensive souvenir. 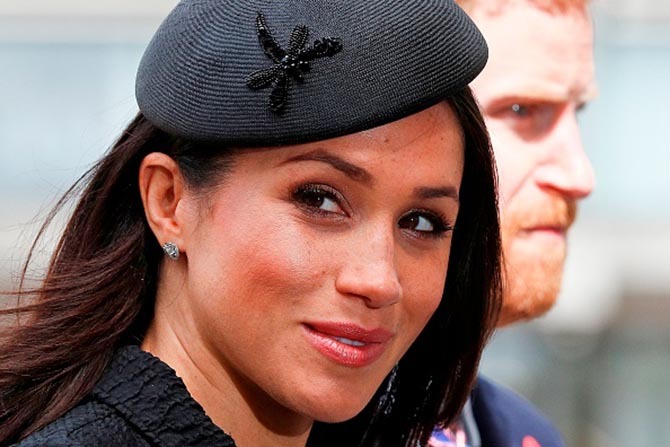 Meghan’s jewelry collection includes lots of rings in a range of prices that she loves to stack with her three-stone diamond engagement ring. The eagle-eyed style watchers over at Meghan’s Mirror have identified all them. In the photo above beginning with the index finger she is wearing, a Catbird Threadbare ring ($44), a Birks Rose Gold Diamond Snowflake Ring ($4,995), Birks Iconic Stackable Yellow Gold and Diamond Ring ($1,495) and a Missoma Round Pave Interstellar Ring in gold vermeil ($61). 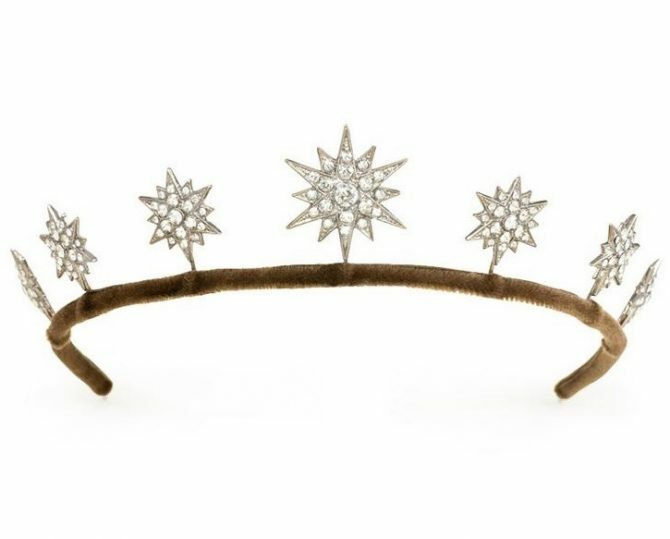 If you would like to do a little royal family cosplay so to speak and wear a tiara like Meghan did for the royal wedding, the best examples, that don’t cost a Queen’s ransom, are available at Kentshire. The jewelry emporium has an array of vintage-inspired styles made with Swarovski crystals for under a $1,000. If you are going to go all in for a tiara, you might as well pick up the official china too. 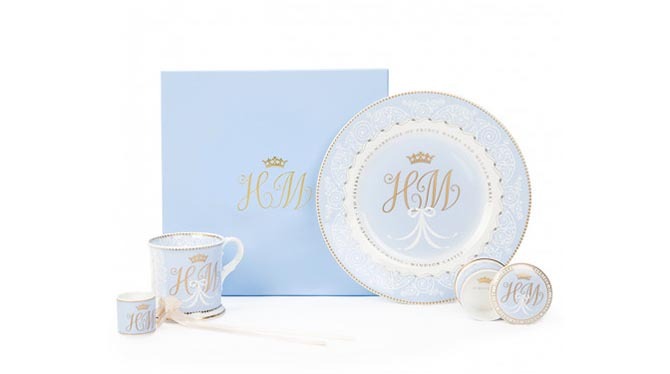 The commemorative plates and cups with the couple’s monogram, as well as short bread biscuits and cakes, are all available at the Royal Collection shop in prices ranging from around $8 to $66.